The 2018 Rugby Canada Annual Awards recipients & Hall of Fame Inductees have been announced! Canada's men’s sevens program was highlighted in 2017 by an incredible run in Singapore which saw Canada beat 3 of the top 5 teams in the series, including arch rivals USA in the final, on the way to their first ever World Series cup title in 140 tournaments dating back to 1999. Toronto, Ontario’s Lucas Hammond made history by scoring the game-winning try against USA to secure the team’s first-ever Cup Title on the HSBC World Sevens Series. Despite being only 24 years old, Hammond has developed into one of the team’s consistent performers and leaders on-and-off the pitch as well as one of the best sweepers in the game of sevens. Mike Fuailefau was a constant threat to opposition on the World Series in 2017 with his powerful running and big hits. The Victoria, BC native capping off a successful year with an inclusion in Cape Town’s tournament dream team that saw Canada finish in 4th place. Since making his debut as an 18-year-old in 2006, Nate Hirayama has built a global reputation as one of the top playmakers in the game. The sevens veteran became Canada’s all-time top points scorer in 2017 when he surpassed Phil Mack, reaching the 1000 points milestone in the process. Justin Douglas played a crucial part in Canada’s most memorable season on the World Series to date, helping the team to 3 cup quarterfinals, 3 cup semifinals as well as the cup title win in Singapore. The flying winger dazzled crowds with his blistering pace and was a constant threat to opposition. With 92 tries to his name already, it won’t be long before the Abbotsford, BC native joins the 100 club. Ladies and gentlemen our 2017 men’s sevens player of the year…Justin Douglas. It was another fantastic season for Canada's Women’s Sevens Program, as the team finished the 2016-17 season in third position. Canada also made history by winning their third-ever HSBC World Rugby Women’s Sevens Series Title by upsetting the hosts Australia in the semi-finals and their North American Rivals USA to capture gold in Sydney. Canada also took home hardware with second place finishes in Japan & Langford, along with third place in France. Ontario’s Brittany Benn was one of the most influential players on the 2017 World Series. The powerful runner racked up an impressive 95 ball carries to set up multiple tries for her team-mates while also crossing the line on 20 occasions herself. Olympic bronze medallist and dangerous finisher Bianca Farella is known for beating defenders and breaking lines. 2017 was no different as she did what she does best and broke the line on 20 occasions and also finished the season, like Benn, with a very respectable 20 tries. Another Ontario native. 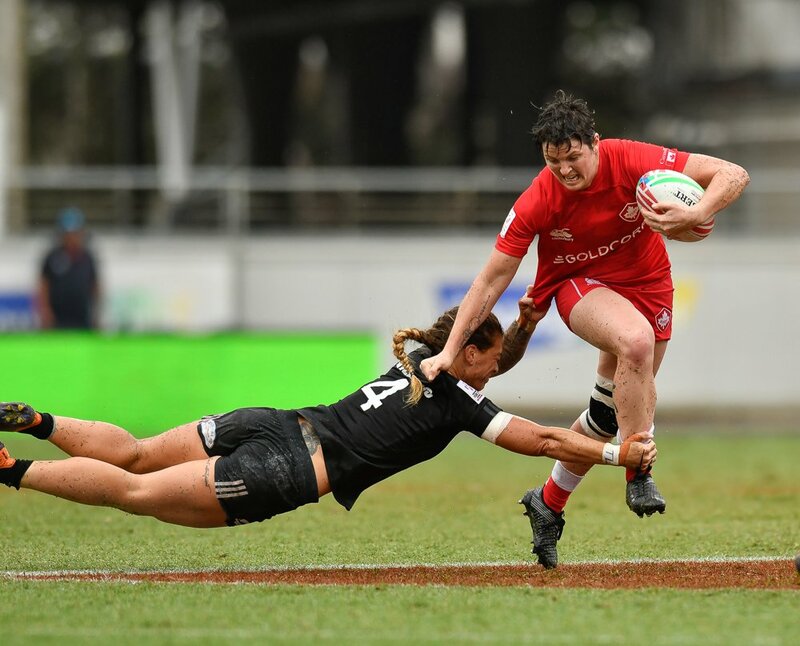 Julia Greenshields’ season was highlighted by an unbelievable individual performance in Japan where she scored a tournament high eight tries as Canada claimed the silver medal. She finished the calendar year with 24 World Series tries. Ghislaine Landry had a record-breaking season, scoring an unbelievable 269 points which lead all scorers on the women’s world series. The try scoring machine from Toronto, Ontario also surpassed the 100 try milestone and is set to continue rewriting the history books in 2018. The fearless Captain once again lifted silverware as tournament champions, as Canada won the tournament in Sydney! Ladies and gentlemen our 2017 women’s sevens player of the year…Ghislaine Landry. The women’s rugby world cup was certainly the highlight of the 2017 calendar as Canada embarked to Ireland to compete in the premier international competition in rugby union for women and capped the tournament with a 5thplace 43-12 victory over Australia. 2017 University of Calgary female athlete of the year DaLeaka Menin continued to wreak havoc on opposition, both through her dominant set piece play and around the park with big hits and thundering runs. The 22-year-old helped Canada win the CAN-AM Series, started in all three Women’s Rugby Super Series games in New Zealand and all five matches in her Women’s Rugby World Cup debut in Ireland. Despite fighting through injuries throughout most of the year, Zussman continued to excel as one of the most reputable finishers in women’s rugby and helped lead Canada to a 5th place finish at the Women’s Rugby World Cup, which was her third campaign in her extensive career wearing the maple leaf. Only the third player to earn 50 caps in women’s fifteens rugby, Kelly Russell had a very memorable season. Running out for the first ever women’s barbarians match alongside team mate Amanda Thornborough, helping win the two-game CAN-AM series and Captaining Canada to a 5th place finish at the World Cup. Widely regarded as one of the greatest athletes – male or female – to wear the Maple Leaf for 11 seasons in both Sevens and Fifteens, Russell left an incredible mark on Canadian Rugby when she announced her international retirement and has now moved on to coaching in her hometown of Toronto, ON. Ladies and gentlemen our 2017 women’s rugby player of the year…Kelly Russell. Canada’s Men’s Rugby Team had another busy year in 2017, competing in the 2017 Americas Rugby Championship, four test matches during the RISEAsOne Summer Series and another busy November campaign in both Vancouver and Europe, including a fixture against the NZ Maori All Blacks in front of a historic crowd at BC Place. 25-year-old Taylor Paris had an exciting season after signing for French Top 14 team Castres, making eight appearances. The winger also represented Canada in six test matches, scoring an impressive eight tries that included a first international hat-trick against Chile in the ARC. Lindsay, Ontario native Brett Beukeboom was a regular starter for Canada’s national team in 2017. The lock featured on eight occasions and Co-Captained Canada throughout the RISEAsOne Summer Series in Alberta, Ontario and San Diego. DTH van der Merwe surpassed Winston Stanley as Canada’s all-time try scoring record with a brace against USA at Tim Hortons Field in Hamilton. He touched down for 5 tries in as many games in 2017. The explosive back and co-captain of Canada’s Men’s Team during their Summer Series also won the Top 12 with former club Scarlets, becoming the only player to win back-to-back Top 12 Championships with two different teams, before signing for the Newcastle Falcons in England. Matt Heaton had a breakthrough season in 2017. The 6ft3, 202lb lock from Godmanchester, Quebec started in 7 of Canada’s 12 test matches. The towering 24-year-old, who plays for Darlington Mowden Park in England’s National League 1, impressed in the back row with thundering tackles, powerful runs and an excellent work-rate and is set to form a vital part of the national team in the years to come. Ladies and gentlemen our 2017 men’s rugby player of the year…Matt Heaton. A tenacious player from the New Brunswick rugby community, our Men’s Young Player of the Year has transitioned westward to play for a top tiered James Bay team. Quickly after arriving, he was signed to the centralized program and began his career with the age grade program. He continued his success gaining his first cap playing in the Americas Rugby Championships; was a member of the U20 team in the series versus USA; and dominated the opposition in scrums at the U20 World Rugby Trophy. His hard work and leadership paid off when he was selected to be a part of the November Internationals squad in 2017. His achievements have been commemorated by his home province and club; having created a substantial impact for young athletes. Ladies and gentlemen, your 2017 Men’s Young Player of the Year…. Cole Keith. Starting from a young age, our Women’s Young Player of the Year continues to dedicate herself to the sport of rugby. She had an exceptional 2017, helping Canada earn a silver medal at the Youth Commonwealth Games, gold at the Tropical 7’s Tournament, and were plate winners at the Euro 7’s. She provided her team a try in each of the Canadian U18’s team victories over the US as they swept the Can-Am series in August. She’s the driving force behind her hometown club and high schools success, and continues to look to develop herself on and off the field by exhibiting sportsmanship and accepting her role model status willingly. Recognized as the Rugby Ontario Junior Female Provincial Player of the Year, and defined by her peers as competitive, committed, and self-motivated; Ladies and gentlemen, your 2017 Women’s Young Player of the Year…. Taylor Black. Known as one of the top coaches in neighbouring communities, our Male Coach of the Year is an ambassador for the sport of rugby in his hometown club of Peterborough, Ontario where he has been an instrumental factor in developing the minor program to one of the largest in the country. Over the last 15 years, he has dedicated his life to the sport, and volunteering his time to coach a number of levels, finding success this past year with his Senior Boys’ team winning the A/AA OFSAA gold. He is currently coaching at Adam Scott CVI, working directly with the male and female rugby programs, acting as the minor rugby coordinator, and a consultant for the senior men’s team. Other recognition for his impact in the sport of rugby includes being recognized by the OCAA as the Coach of the Year in 2014 and 2015 while leading his Trent University Men’s Program to the top of the podium. He is an integral part of the rugby community and continues to set an example for coaches of all experience levels. Ladies and gentlemen, your 2017 Male Coach of the Year…. David McCully. Winner of Rugby Ontario’s 2017 Female Club Coach of the Year, this coach earns the same honour from Rugby Canada after guiding the Belleville Bulldogs U16 girls team to becoming the 2017 RO Cup Champions, and the Bayside SheDevils to OFSAA gold. Her willingness to dedicate her time into seeing youth succeed in the sport is one of her most extraordinary traits. Along with being player coordinator at the club, she is never too busy to help develop participants whether she is coaching or playing herself. A visionary when it comes to leading her teams, she strives to understand and respect each and every player, while continuing to excel in her role as a coach. Athletes and parents define her as the heart of the club and an instrumental force with regards to introducing the sport of rugby to many young athletes in the Quinte area, several who have gone on to play at the provincial and national levels. She truly gives her all to this sport and her passion is contagious. Ladies and gentlemen your 2017 Female Coach of the Year… Jo Anne Robinson. Born and raised in Vancouver, our Match Official of the Year began playing rugby in school in the early 1960's going on to play club rugby with the University of BC, Georgian RFC, and UBC Old Boys. He started his career as a referee in the 1980s with the Vancouver and Fraser Valley Rugby Referee Society, becoming a Life Member in 2007.He was a member of the Rugby Canada National Panel of Referees from 1999 - 2005, and refereed in 2002 at the U19 World Championships in Italy. He has continued to be active as an accredited referee coach and has been a member of the Rugby Canada Match Officials Advisory Panel for many years. He is also a World Rugby accredited citing commissioner and has utilized his background as a lawyer and referee to achieve membership on the World Rugby Judicial Panel where he has acted as a Judicial Officer in many World Rugby 7s Tournaments including the 7's World Cup in Dubai in 2009 and countless World Rugby 15s appointments including the last 3 British and Irish Lions Tours to South Africa, Australia and New Zealand as well as Rugby World Cup 2015. In addition, he has acted as a Judicial Officer for many Rugby Canada events over the last 10 years and is Rugby Canada's Chief Disciplinary Officer as well as Chair of the Rugby Americas North Disciplinary Committee. This past year he acted as judicial Officer for the Americas Rugby Championship, the Vancouver Men's HSBC World Rugby 7s, the Women's World Rugby 7s in Langford, as well as Tier 1 Internationals in Australia. In 2018 he has already been appointed to the Americas Rugby Championship, the Vancouver Men's HSBC World Rugby 7s, and the Commonwealth Games to be held in Australia in April of this year. He has also recently been inducted into the BC Rugby Hall of Fame. With such a busy schedule he has continued to find time to utilize his exemplary role to not only referee but, also to act as a referee coach. Ladies and gentlemen your 2017 Match Official of the Year... Alan "Huddy" Hudson. Selflessly investing countless hours, our Volunteer of the Year has been a volunteer with the Edmonton Rugby Union and a member of the Alberta Rugby community for over 35 years. She’s held positions such as the Edmonton Rugby Union registrar, website manager, statistician, fundraising chair, and Vice President of the Ellerslie Rugby Park Board. Her unwavering commitment, passion and dedication to registration, administration, and many other facets of growing the sport of rugby have gone above and beyond what would ever be expected from a volunteer position. Known as the backbone of rugby organizations in the northern Alberta region, she has taken on volunteer coordinator roles with International fixtures that have generated success in Edmonton. Her leadership is unquestionable, as well as her strong will and sense of diplomacy to get the job done. Understanding what it means to lead by example, she consistently acts with integrity. She is the pulse of the Edmonton Rugby Community. Ladies and gentlemen your 2017 Volunteer of the Year…. Judy Seddon. As a small province, Union has certainly reshaped the way people view rugby. Over the past year they have had much success on and off the field. The number of rugby players has grown dramatically with over 3,000 kids being introduced to Rookie Rugby, and the Provincial program now consisting of 11 teams, a growth from 4 teams in 5 years. A partnership with CSCA and the Keltics Academy Program allows for operation in three geographic areas and involves more than 75 U18 athletes, focusing on the areas of strength and conditioning skills, mental preparation, nutrition, and life balance. Furthermore, the Provincial Union provides multiple coaching development opportunities across the LTAD (Long Term Athlete Development) model, and was a recipient of CAAWS Award for their development and support of female referees. A successful Youth 7s Series where the final tournament included 23 teams hailing from NS, NB, and PEI, exceeding over 230 athletes. In addition they are tackling Mental Health head-on through their campaign “If you talk, I will listen. If you listen, I will talk.” Selling bracelets featuring the tagline with half the proceeds going to the local Mental Health Foundation, and the other half designated to a support fund for younger players striving to reach high-performance. This campaign has raised awareness of mental health and gained momentum across the country and overseas through the support of fellow athletes, teams, and organizations. Ladies and gentlemen, your 2017 Provincial Union of the Year…. Rugby Nova Scotia. Immigrating in 1972, Birtwell came to Canada from England having played for Sedgley Park, Kings College, University of London, and Hampstead. He joined the Meraloma Club in Vancouver, but in 1975 repeated injuries stopped him playing and he started coaching. Initially, and over 4 years, he coached his club and representative junior-age teams. Over the next 9 years he coached senior men’s teams for the club, Vancouver District and British Columbia. At all these playing levels his teams were highly successful and victorious in domestic, national, and international competition. In 1989 Birtwell was appointed as National Coach of the Senior Men’s Team were he held this position for six years - the longest term of any Canadian National Rugby Team coach to the present day. Dr. Birtwell’s coaching philosophy interpreted the demands and challenges of the international game, and he understood how these had to be met and what skills and strategies to employ and develop. His time of coaching all levels provided an opportunity to hone and verify his methods, and he was ahead of his time in the use of analytics and working alongside sport scientists. Birtwell and the National team produced positive results, finishing with a record of 22-16 over the course of his six years in charge. Birtwell’s squad for the 1991 Rugby World Cup gave an exceptionally strong showing, losing to New Zealand in the quarter-finals. The team was given a standing ovation based on their inspiring performance in that game and during the competition. The team’s World Cup performance elevated them to a notable top 8 world ranking, the highest achieved by the National Men’s Team. Through Birtwell’s leadership Canada’s Senior Men’s Team became known internationally as a rugby side which was competitive with the best and one that continuously developed, was strong up front, resourceful behind, and with a brilliantly strong defence. He took Canadian rugby into uncharted territory. Mario Gallo began playing rugby at St. James High School in Guelph launching a career that would last fifteen years and take her around the world. She starred as a member of the Guelph Gryphons from 1996-2000 leading her team to four provincial titles and the inaugural CIAU championship in 1998. She and the Gryphons would win the CIAU silver medal the following season. Both times she was named a tournament all-star and the event’s most valuable player. Gallo was a two-time OUA all-star (1997 & 1998), an All-Canadian in 1998, and Guelph’s Female Athlete of the Year that same year. After graduating from the U of G, she moved to the University of Alberta where she won two more national titles in 2001 and 2003 and was named the Panda’s Female Athlete of the Year and the CIAU Player of the Year in 2002. She did all this while earning her Ph.D. in Muscle Exercise Biochemistry. Her next stop on the rugby pitch was playing for Canada. She was a vice-captain for several years playing on the national 15’s rugby team from 1999 to 2010. She was a mainstay of the national team playing a total of 55 international caps and in two World Cups – 2002 and 2006. In 2006 she had the second most tries of any player in the event with six. Gallo played with Canada’s national 7’s rugby team from 2008-2010 where again her leadership and dogged determination paid off as she was named team captain leading our country into the 2009 World Cup. In 2002 and 2003 she filled her winter months as a member of Canada’s Bobsleigh team, finding the power she had developed in rugby was a natural fit when it came to the explosive starts necessary in bobsledding. Gallo is now the head coach of the UBC Thunderbirds Women’s 7’s and 15’s rugby teams taking the 7’s squad to their first national title in 2016. While at UBC she completed her post-doc in blood doping and in 2010 was elected to the Guelph Gryphon Hall of Fame. She was also inducted into the Guelph Sports Hall of Fame in 2016. Born in Derby, England Monty Heald became involved in rugby at Royal Masonic School, in 1949. He played for Derby R.F.C. over a fifteen year period, captaining the team for two years. Immigrating in 1968, Heald played for the Hamilton Hornets from 1968 to 1972. In 1973 the Burlington Centaurs Rugby Club was founded, where Heald became a founding member and the Club’s first captain. Heald’s commitment ultimately earned him Life Member of the Club recognition. Ending his playing career in 1988, Heald chose to continue his involvement in the sport by maintaining administrative roles at a number of levels. He served the Niagara Union as the Director of the Senior Team, and the Ontario Rugby Union as a selector for two years. In 1981, Heald became a National Selector, chairing the C.R.U. Selection Committee from 1983 to 1994. In 1984 he was appointed as the Manager of the Canadian Sevens team and was elected to the Board of Directors of the Canadian Rugby Union in 1986, serving as Director of The National Team until 1991. In 1991, he was elected as President and served in this capacity for eight years. During his leadership, the Union effected a major change in name to Rugby Canada, leading to the National Union becoming significantly more involved in the activities and programs of the International Rugby Board – or World Rugby as we know it today. In concluding his term as a Director, Heald’s total years of service to the National Union capped off at 20 years. He continued on as Chair of Rugby Canada’s Past Presidents committee, Chair of the Hall of Fame committee and member of the Annual Awards Committee. For his endless support and dedication to rugby in Canada, Heald was given the honour of an Honorary Lifetime Member of Rugby Canada in 2013. Widely recognized as an architect of the game for women in Canada. A force and a leader on the field in the beginning days of the game, she devoted considerable efforts to expand and raise the level of play in three provinces. Ruth represented the Alberta Rugby Union, Saskatchewan Rugby Union, and BC Rugby Union at National Championships from 1984 to 1993. A member of the 1987 squad, Canada’s first women’s rugby team, Ruth also took on the role of Director of the National Women’s team for that inaugural match. As an international player, she earned 11 caps, captaining the team on 9 of those occasions. Her first and last caps were against the USA in 1987 and 1993. In British Columbia a once flourishing women’s league had dwindled down to only one in the lower mainland by the late 80’s. This prompted Ruth to establish a women’s team at the Vancouver Rowing Club upon moving to Vancouver - offering up at least one other competitive team. Once the Rowers were well established Ruth launched another team at the University of British Columbia in 1991 where she was pursuing a second degree. Ruth began her coaching career with UBC Women’s Rugby team and continued to lead the team for three years after which she returned to coaching at the Rowing Clud. She earned her NCCP Level III coaching certification and coached the BCRU Senior Women’s team for many years, being one of the first women to coach a provincial squad to a National Championship. In BC, in particular, her impact on the development of the game for women is indelible and is recognized in the naming of the Senior Women’s premier competition in her name, the Ruth Hellerud-Brown Cup. McTavish’s high level of performances and record during his rugby career as a club, sub-union, provincial, and national team player is quite remarkable. After a stellar career at UBC, he was a founding member of the UBC Old Boys for whom he played from 1974-1989 and coached them to two provincial titles in 1990 and 1991. He returned to UBC in 1992 and coached there until 2014. Having not yet been selected for BC, McTavish was chosen to represent Canada against Fiji in 1970 and by 1987 had become both BC’s and Canada’s longest serving player of international standing. He scored a try in his first ever game and seventeen years later was in the lineup for two of Canada’s three appearances in the very first Rugby World Cup. McTavish’s 22 international appearances for Canada from 1970-1987 were remarkable considering that only one other Canadian player has had the equivalent longevity on the national team. His ability as a leader was verified by his captaincy for two of four overseas tours made by Canada. On the 1979 Wales, England, France tour, he played in all six games and was captain of two. McTavish’s talent was recognized overseas by his selection to the Irish Wolfhounds in 1973 and in 1976 to the Overseas XV against Cardiff. McTavish’s record in the fifteen-a-side game almost parallels his exploits in the seven-a-side version. During his three years in the Hong Kong Sevens, McTavish was also captain. From 1994-1998 he returned to the 7’s game, coaching Canada’s National 7’s team, including the 1997 Rugby World Cup and the 1998 Commonwealth Games. Believing that one should lead by example, McTavish provided ample evidence during his outstanding career for others to emulate. Douglas Moore, known to most as "Buzz", moved to Vancouver from Regina in 1925 at age 4. His time at Vancouver’s Lord Byng High School allowed Buzz to excel at football, skiing, and rugby. Showing much promise in rugby, he joined the Meraloma Rugby Club at age 16 and began playing for the senior side. During a prolific senior rugby career that lasted twenty-eight years, he was awarded the Howie McPhee Memorial Trophy as Vancouver’s outstanding rugby player. Buzz captained both the BC and Canada sides in 1948 until 1962 against Australia, New Zealand, England, Scotland, Wales, Ireland, USA, Japan and Fiji. At 42, he led Canada on a three-month long tour of Great Britain during which his side took on the famed Barbarian Club. A 3-3 tie resulted after which Buzz was presented with one of rugby’s highest awards, “Honorary Barbarian”. Buzz retired from play in 1965 following a Canadian Rugby Championship with BC. Throughout his career he held various administrative roles including Coach and President of the Meraloma RFC, President of the BC Rugby Union, and President of the Vancouver Rugby Union from 1954-1966. In 1967 he was inducted as a builder into the BC Sports Hall of Fame and in 1975 was awarded the Jack Patterson Memorial Trophy. Buzz joined the UBC Athletics department in 1964 and was consistently involved there until his death in 2011. Buzz was inducted into the UBC Sports Hall of Fame in 1995 and received an Honorary Doctor of Laws Degree from the University in 2002. A forefront for women’s rugby, White chose to take up the game in 1980. She was active in the administration of Women’s rugby for the province of Alberta while being a trailblazer on the field of play. She was the Captain of the First Canadian Women’s Rugby team in 1987 and 0represented Canada in the early years before being appointed Co-Captain of Canada’s first World Cup Team in 1991. In 1994, she Captained the team at the Second Women’s Rugby World Cup and continued her involvement with the National team participating in two Canada Cup competitions. She also captained the first participating Canadian women’s team at the Hong Kong Sevens invitational tournament in 1997. White retired from Representative Rugby in 1997 and earned a total of 17 caps in 10 years of play. Along with her distinguished playing career, White devoted years to the growth women’s rugby in Canada. Some of her major contributions include being a director on the Alberta Women’s Rugby Union; Director of Women’s Rugby on the Board of Directors for Rugby Alberta in the late 1980’s; was the Women’s Players representative at the Rugby Canada Strategic Planning session in 1995. She sat on the B.C. Rugby Union Board of Directors and helped bring the West Coast Women’s Rugby Association into the BCRU in the early 2000’s and served on the Rugby Canada Board of Directors from 2007-2013.